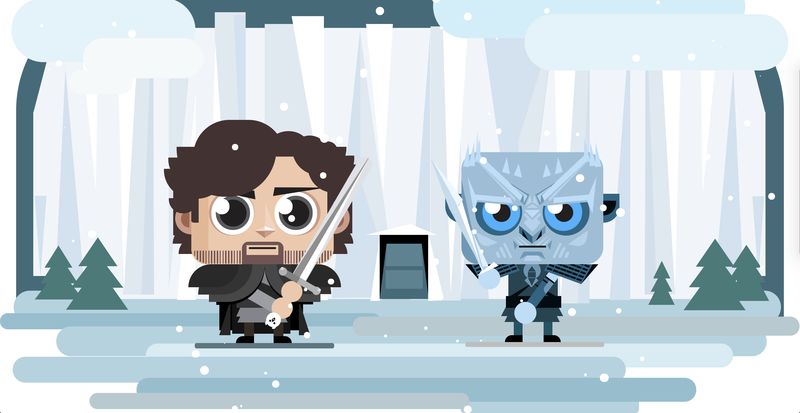 A scene from Game of Thrones coded in CSS and HTML. There are no images used whatsoever - only code. This is the combined work of several frontend developers, including me. The purpose was to learn new things and work in a larger team. As a result we achieved a complex and animations-heavy interactive drawing using SCSS and HTML only. The team was split into smaller teams (two devs) and each team worked on a part of the drawing. For example: Jon Snow, The White Walker, the sky, the snowflakes, the wall, the ground and the trees. I coded the White Walker and supervised the team, provided solutions or hints where needed and when everyone was done I merged their work in a single repository. The drawing is completely fluid and adjusts itself to any viewport. This repository contains a PWA version of the drawing, which can be installed on a PWA supported device and/or viewed offline. The demo contains a minified version of the HTML and the CSS output. The PWA can be installed on any device which supports service workers and can be viewed offline.